Strengthen your skills, reflect on career goals, make contacts: Take advantage of our wide range of free workshops, discussions and networking events! Doctoral programs, Junior Research Groups, Collaborative Research Centres: The University Alliance Ruhr offers excellent working conditions for early career researchers. Take a closer look at our international activities and learn more about the career options for international incoming researchers. Research Academy Ruhr – we support your career in research, business, and society. Benefit from the joint and cross-linked offers of the Ruhr-Universität Bochum, TU Dortmund University, and University of Duisburg-Essen for early-stage researchers at all career levels. Between scientific rigor and entrepreneurial relevance: Under this motto, the Witten Institute for Family Business (WIFU) invites you to an interesting lecture series with internationally renowned lecturers. Interested researchers can apply for this year's RUHR School of Modern Epidemiology, which will take place from 9 to 11 July in Essen, until 24 May 2019. Is a doctorate the right step for me? And what is the best way to prepare for it? 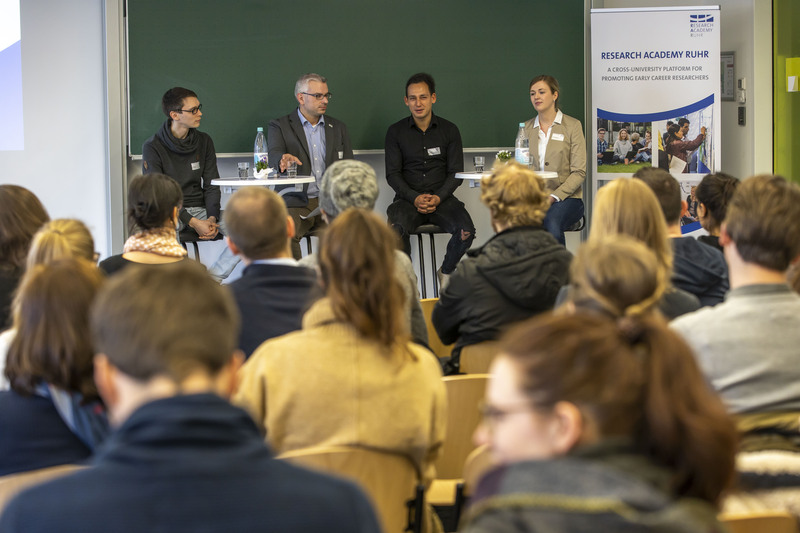 More than 100 interested students took advantage of this year's Frühjahrsakademie to deal with these questions and exchange experiences. Do you have any questions or suggestions? Please get in touch with us!